To visit this website, please confirm you are an adult. This service, like alcohol, is intended only for adults. As a socially responsible company, we take good care of people and our environment. We get involved in voluntary work, support the development of our employees and business partners, promote responsible alcohol consumption and sales, save water and energy by executing the Bet on Beer strategy. We are aware that business viability depends on social development, including our employees, economic health of our communities, and responsible use of natural resources. Therefore, we have integrated these issues into our sustainable development strategy – Bet on Beer. We want a thriving world, where incomes and quality of life are consistently growing. We support the development of our employees. We collaborate with business partners, including distributors and retailers within our global value chains, by supporting their own development and growth of their businesses, families and communities. We invest in local communities through social programmes and corporate volunteering. We sponsor cultural and sports events. How can you help with everyday actions? Look for ways to support local initiatives. Use your skills to help local businesses, for example join an organisation that supports small businesses. We want a sociable world where our beers are developed, advertised, sold and consumed responsibly. We strive to make beer a natural choice for moderate and responsible drinkers. We say NO to driving under the influence, underage drinking and alcohol consumption during pregnancy. Our goal is to reach all of our beer consumers with effective communication promoting responsible consumption of beer – our own or through our partners. We support responsible retail practices through retailer training and engagement. We encourage and support the establishment and enforcement of clear standards for on and off premise sales of beer. We support programmes aimed at increasing road safety awareness as well as preventing driving under the influence and underage drinking. We include sustainable development messages into activation of our biggest brands. Be a role model for responsible drinking at home, at work, among friends and in your community. Encourage others to drink responsibly. If you’re going to have a few beers, plan ahead and don’t drive. We want a resilient world, where our businesses, communities and ecosystems share uninterrupted access to clean water. We continue to tackle water risks and reduce water consumption during beer production across all of our breweries. Working closely together with our partners, we will secure water supplies to all of our facilities with the use of detailed risk analysis conducted in each brewery, in order to minimize the risks we share with local communities. We introduce improvements aimed at reduction of water consumption during production of beer. Think about the water you use each day – both at work and at home – and only use as much as you need. Turn off taps tightly and repair any leaks. Look for opportunities to reduce, reuse and redistribute water both at work and at home. W want a clean world where nothing goes to waste and emissions are dramatically reduced. As a production company, we leave our ecological footprint, therefore we continue to lower our impact by focusing on reduction of pollutant emission and the amount of produced waste, while simultaneously increasing the level of recycling. One of the most important activities within the scope of environmental management is keeping the registry of relevant environmental aspects. Out of all of them, each year we select the most important ones and combine them with our current environmental goals and tasks. Over the last few years, we’ve been mainly focusing on optimization of environmental processes and replacing old equipment with more eco-friendly machines. Can a fridge help cool the climate? Our consumers enjoy the refreshment of a cold beer but refrigeration can have a harmful impact on the environment, contributing to climate change due to the use of energy and gas. Which is why since 2013 we’ve been supplying our Polish retail network with fridges equipped with propane gas refrigerants. This innovation reduces the cost of cooling covered by retailers, while removing the harmful global warming impact of the gases used so far. And our consumers can still enjoy cold beer. We’re also investing in energy-saving devices and LED lighting, reducing the energy consumption of older fridges by up to 40%. Not only are we working towards reduction of CO2 emissions and waste in our own plants, but also helping our suppliers, customers and local communities do the same. Reduce, reuse and recycle waste wherever possible. If there isn’t a recycling program at your workplace or in your community, why not start one? Walk or cycle for short journeys and turn down air-conditioning or heating at home and at work. Buy products that can be recycled or ones with reusable packaging. 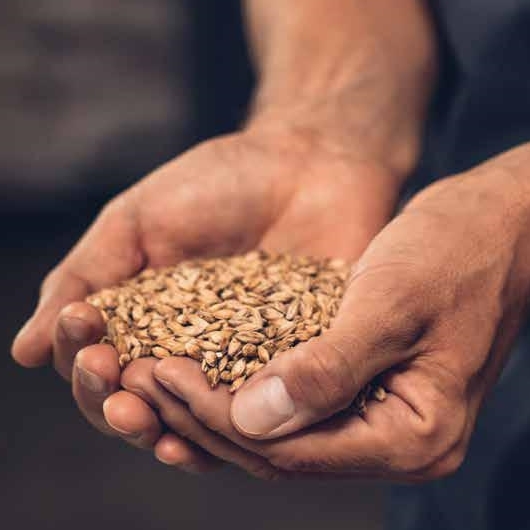 We want a productive world where land is used responsibly, food supplies are safe, biodiversity is protected and brewing crops can be accessed at reasonable prices. We bet on local products and brew our beer with the use of barley malts and hops. The ingredients must come from trusted farmers and their quality has to be of the highest level. We plan the deliveries in advance in order to ensure continuity of production and secure future supplies. At the same time, we make sure that the farms meet sustainable development standards, and we closely cooperate with suppliers who maintain long-term trade relations with Polish farmers. This approach guarantees strategic development for the company and our partners, who can expect further orders due to long-lasting contracts. Grow plants that support local biodiversity and pollinators, such as bees. Learn more about local agriculture to understand where your food comes from. Help arrange a school visit to local farms, so children can learn about agriculture. “Kompania of Volunteers” is a corporate volunteering programme that was created thanks to and for volunteers who care about their local communities. For years, our employees have been actively supporting institutions and non-governmental organisations, and they do so with energy, openness, and, above all, out of the goodness of their hearts. They share their time, skills, and knowledge, while Kompania Piwowarska allows them to engage in social activities also at work, providing financial and organisational support. The support we provide within the Kompania of Volunteers programme is in line with our sustainable development strategy “Bet on Beer” and aimed at adults only. Since 2016, we have been proudly supporting the WIOSNA Association within the Noble Box programme. Kompania Piwowarska co-funds preparation of the packages and helps deliver them to warehouses and families in need. Each of the two first editions of the programme has engaged about 1,300 of our employees, thus the Noble Box turned out to be the greatest volunteering programme in the history of our company, and we keep pushing it forward every year. Kompania presents its noble activity! WHAT CAN YOU LEARN FORM THIS YEAR’S SUSTAINABLE DEVELOPMENT REPORT? Kompania Piwowarska has been consistently placed among Poland’s responsible business leaders. This year, we would like to present our ninth sustainable development report. 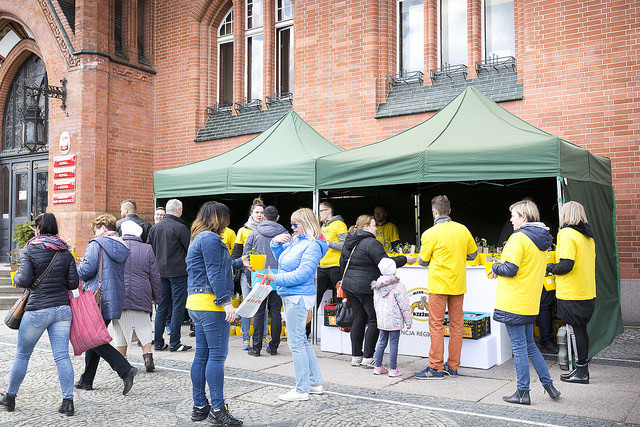 This time we invite the readers to meet over a beer so we can explain how we support the development of our employees and business partners, take good care of people and our environment, promote responsible and moderate consumption of alcohol, and passionately engage in volunteering. Kompania Piwowarska strives to maintain high ethical standards. We are consistently building our reputation through a broad approach to our social responsibility and the rules of honesty and reliability in dealing with our suppliers and customers. It is crucial for us that the ethical standards set out in our Code of Ethics are observed. We are a company that maintains high ethical standards not only within the company itself, but also in the entire supply chain. We believe that ethical behaviour, acting in good faith and expressing openness and honesty are fundamental to successful business activity. In order to support and promote ethical behaviour more effectively, we established the Ethics Committee in August 2012. It comprises members of KP’s top management, while its work is supervised by an independent, external Chairman. If you wish to receive information on how your complaint is being investigated, please provide your full name. In accordance with Article 24, Section 1 of the Act of August 29, 1997 on the Protection of Personal Data (uniform text: Journal of Laws of 2016, item 922), we kindly inform you that the Administrator of your personal data is Kompania Piwowarska SA [more] with its registered office in Poznan (61-285) at Szwajcarska 11, hereinafter KP. Your personal data will be processed by KP for the legally justified purpose of providing an answer to your enquiry. Your personal data will not be shared with other recipients of data without your explicit consent, unless it is required by separate law regulations. You have the right to access and update your personal information. Providing the above-mentioned data to KP is voluntary, yet necessary for us to reply to your message.